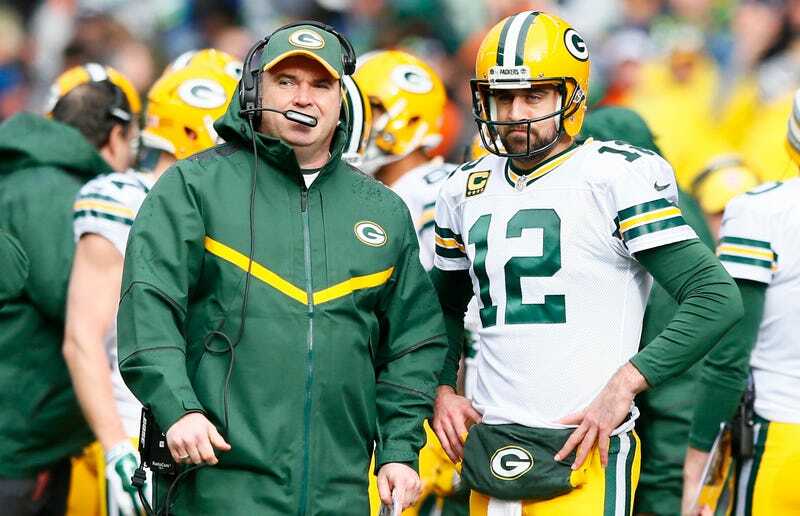 Aaron Rodgers Insists He Got Along Fine With Ex-Packers Coach Mike McCarthy, Says They're Just Both "Alpha Males"
Aaron Rodgers has broken his silence on last Thursday’s Bleacher Report feature about the rift between him and former Packers head coach Mike McCarthy. On a radio show today, Green Bay’s quarterback insisted that he and his old coach got along fine and were just “two alpha males” butting heads, which is a really generous compliment to Mike McCarthy. Another tidbit was that before hiring new head coach Matt Lafleur, Packers CEO Mark Murphy reportedly called Rodgers and told him, “Don’t be the problem.” The QB said that didn’t happen, and that he had a “great conversation” with Murphy last week where they laughed at the idea that the sentence was ever uttered. As for the fact that ex-teammates Greg Jennings and Jermichael Finley put their names on what they had to say—former running back Ryan Grant also went on the record but was more complimentary of his former QB—Rodgers called them “irrelevant.” They were all on that Super Bowl-winning team, but okay. As far as our relationship, you have to put it through the proper lens like you always have to do with reflection and change. Where there’s change, let’s be real, especially the way the change happened, there’s things that come out after the fact. Things get said. He-said, he-said this and things like that. When I think about my relationship with Aaron, you’re talking about 13 years. That’s a very long time. It’s been a privilege to watch him grow in so many different ways and see him do so many great things on the field and off. To think you can be in a relationship that long and not have any frustrations, that’s unrealistic. To show how totally cool he was and is with McCarthy, Rodgers issued a plea to Green Bay’s fans: “My favor that I would ask of you, strongly, is if you see Mike, shake his hand. Tell him thanks for the memories. Tell him thanks for the coaching job that he did.” Just don’t try talking to the guy at any high school basketball games.